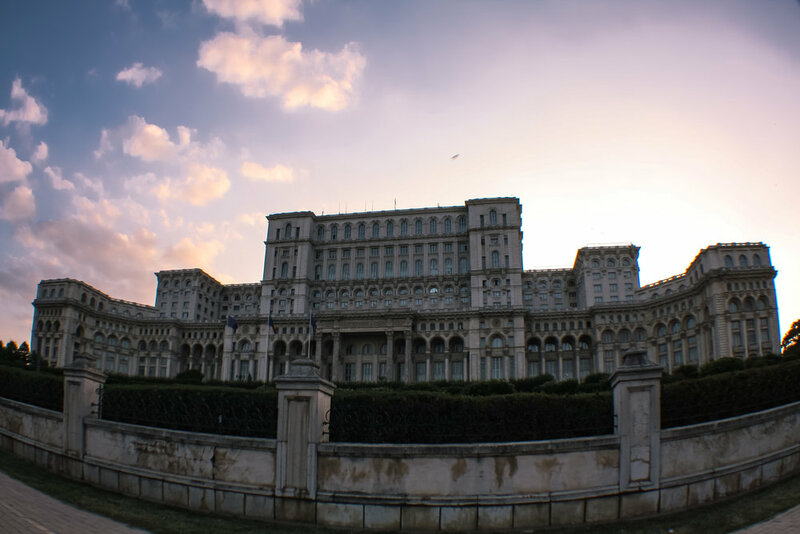 The Romanian capital, Bucharest, was a pleasant surprise for a 4 day visit! Be inspired to book a flight to visit the home of Dracula and find out where to go, what to see & where to eat. To be completely honest, Bucharest wasn't a city that had featured on my travel list. The idea to visit the Romanian capital came from seeing a great deal on the flydubai website. It presented an opportunity to visit a really unique destination. I did a quick bit of googling and it looked like a great place to go and explore for a few days - so I booked flights and a couple of hotels. The international airport is Henri Coanda, also known as Otopeni. It receives flights from a number of European cities, including London. Flydubai has a daily flight departing Dubai and this is an excellent link up for anyone looking to travel via this Middle Eastern hub. Flydubai is a less expensive carrier, giving the option to purchase a ticket without meal and entertainment, which I don't need! The money I save flying with flydubai goes straight into the travel budget for the next trip! The airport is only relatively small and many people don't speak great English. As you exit on the right hand side, there is a stall that sells Orange mobile sim cards. The internet was quite cheap and worked really well. From Otopeni airport, you have several options to reach central Bucharest. There is a bus that goes to downtown Bucharest (service 783), you need to purchase your tickets from a machine inside the airport. Some hotels offer a free shuttle service, which if you get might be worthwhile. I found Uber to work extremely well in Bucharest - if you dotty already have the app on your mobile, I would suggest downloading it and starting an Uber account before, it took all the hassle out of getting around. Many people warn against the taxis in Bucharest, whilst others insist the standards have improved in recent years. From my experience, I would avoid the taxis - they will try to rip you off and many look unsafe. When I couldn't walk somewhere, I tended to use Uber for short car trips and found it cheap, clean and easy to use! Not once did I have any issues at all. The bus service in Bucharest works quite well, but it wasn't often where I needed to be. You can rent bicycles quite cheaply - note you need to purchase a card from one of the I'Velo shops and you can then use this card to swap bikes around the city, which works really well. 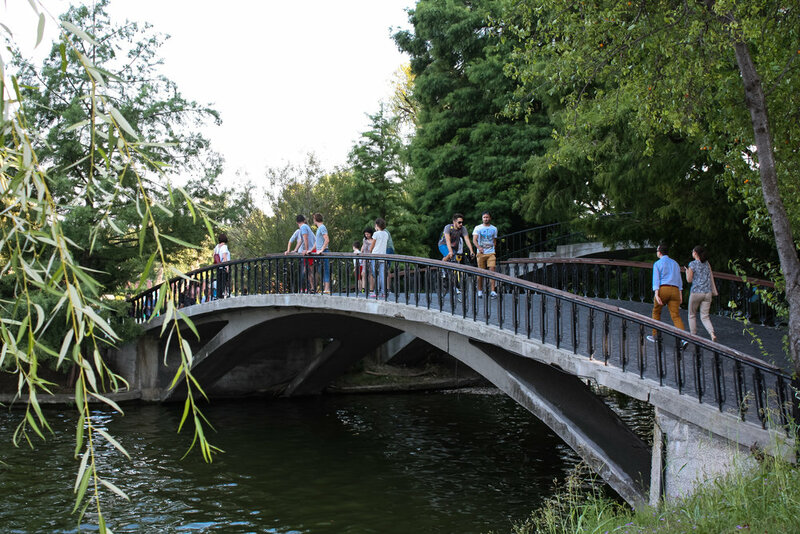 It looks a little crazy to ride around the main streets but definitely in places like Herastrau Park, taking a bike ride is the ideal way to get around! Bucharest is a great city to explore on foot. I did a lot of walking in my 4 days there. If you are a phone tragic like me, Google maps is great in Bucharest, especially since most of the places have names in Romanian and English! I have tried to add the google map links below for all the places of interest. A word of warning for when you are walking around - be very cautious of the cars! They don't always stop at red lights and don't seem to look too carefully for pedestrians, so just always be on the watch! Firstly, I stayed in Concorde Old Bucharest (map)- a 4 star hotel that opened early 2017. I chose this hotel because it had good reviews and its location was perfect for exploring Old Town. It is close to lots of the restaurants, cafes and clubs in Old Town which is perfect if you are planning to experience some of the nightlife in Bucharest. Old Town also has some of the attractions to visit and has a great atmosphere for walking around. The rooms in the Concorde were relatively small and basic. If you are just looking for a base to explore from, its very suitable. The amenities weren't great and there wasn't any complimentary water. The concierge/reception staff weren't great and didn't really have any recommendations for things like places to eat. I would definitely look at staying in or around Old Town if you are wanting to be amongst the night life. 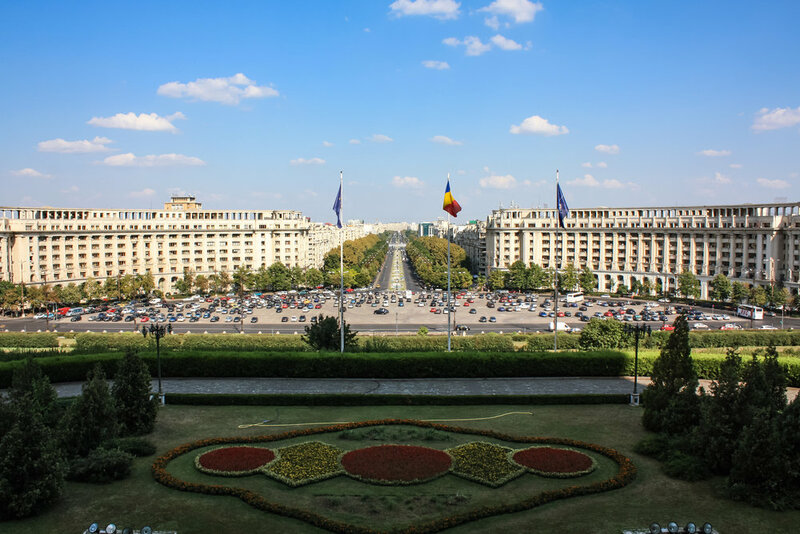 The Bucharest Sheraton (map) is relatively centrally located and is a 5 star property. There was a noticeable difference in the quality and service compared to Concorde and the difference in price wasn't that much. The reception/concierge staff were excellent and gave great advice about places to visit & restaurants. The rooms are very nice, there is a gym/spa thats more than adequate. This area of Bucharest has been revamped - the architecture and cobbled streets are largely original, but they have been developed into restaurants, cafes and boutiques amongst some cultural places. The streets are all closed to cars, so its easy to stroll around. At night, many of the areas flood with people and the clubs along Strada Setani are mostly open fronted, creating a great atmosphere. A main road that runs North-South through Bucharest. It was the first paved road in Bucharest and one of the only ever wooden paved roads in the world. Its ability to be used in the wet winter months made it a hugely important road in the development of Bucharest and the suburbs either side became very wealthy neighbourhoods. It was re-named "Calea Victoria" in 1878 after the Romanian Independence War - the army would march down this road after passing through the Arch of Triumph. 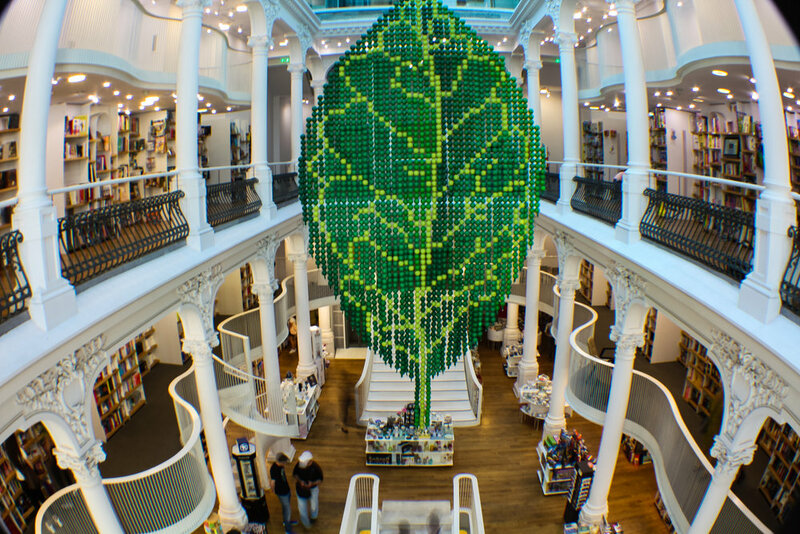 Now, many boutiques and luxury stores line the road. It is a good route to walk up to see many of the interesting features of Bucharest. The most significant building in Bucharest. 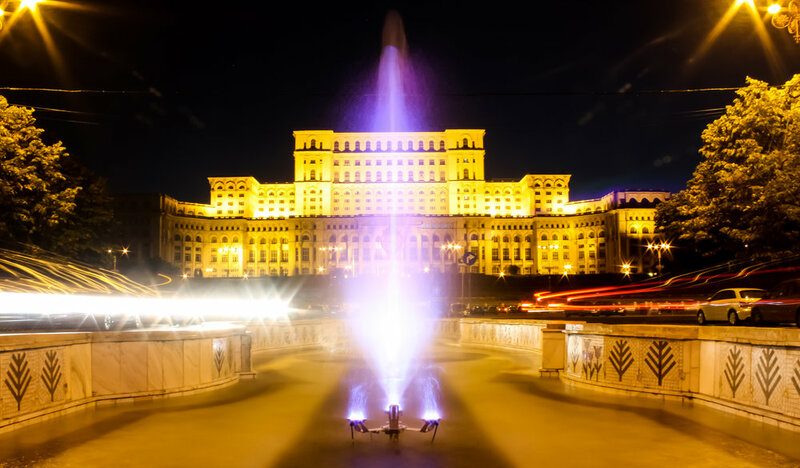 It was ordered to be built by Ceausescu during his reign - he wanted a building for all Government affairs and also for he and his family to live. He had become, somewhat justifiably, paranoid with the fear that people within Bucharest wanted to kill him. The design went to great lengths to protect Ceauscesu, including the exclusion of air-conditioning as he believed people would attempt to poison him through this. The building was only 70% completed when he was over-thrown. Following the Revolution, there was debate about what should be down to the building, with many believing it represented communism. The huge cost that had gone into its construction made it almost impossible to destroy and the decision was made to finish its construction and for it to be used as a Parliamentary building and host large events such as weddings. The building is considered the 2nd largest in the world, after The Pentagon. One of the best view from the outside is from the eastern side - it looks directly at the balcony and is especially impressive at night when it is all lit up. There is a parking lot on the other side of the road and some colourful fountains that provide good vantage points for photography. The North entrance (public entrance) also gives some good views. Guided tours of the interior cost 30L. You will need to book (get your concierge to call) during the busy times and tours are run in different languages at different times. You will need to bring, and then hand over your passport before entering! So if you are not comfortable with this, you won't be permitted entry. It costs extra to take photos with a camera but is free with phones. The tour is interesting, but doesn't give a deep insight into the history - I found that it was "carefully" worded when talking about Ceausescu. The balcony provides a nice view and was the place where Michael Jackson stood and infamously announced "Hello Budapest". There is also a terrace which apparently provides excellent views of the city, but it was closed when I visited due to "technical difficulties". 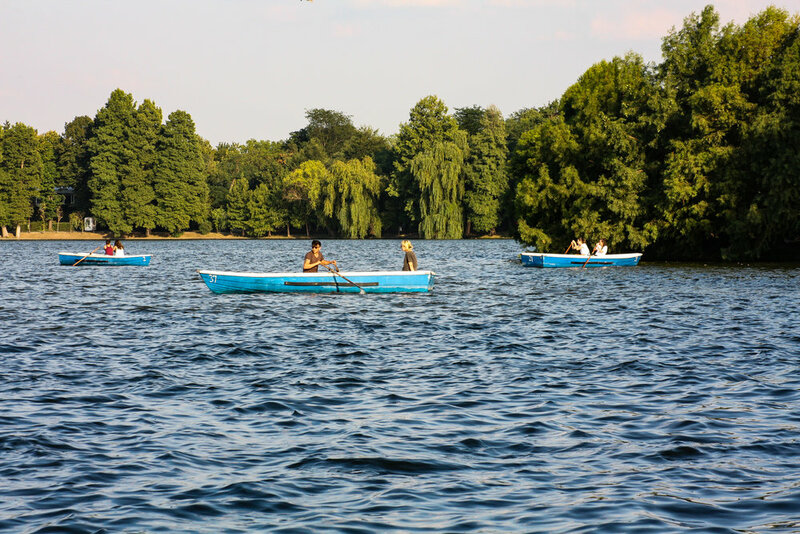 Cismigiu Park (map): The park is around Cismigiu Lake - in the summer you can hire small row boats and in the winter it freezes over for ice skating. Its a nice park to walk through, especially on a Summer evening. 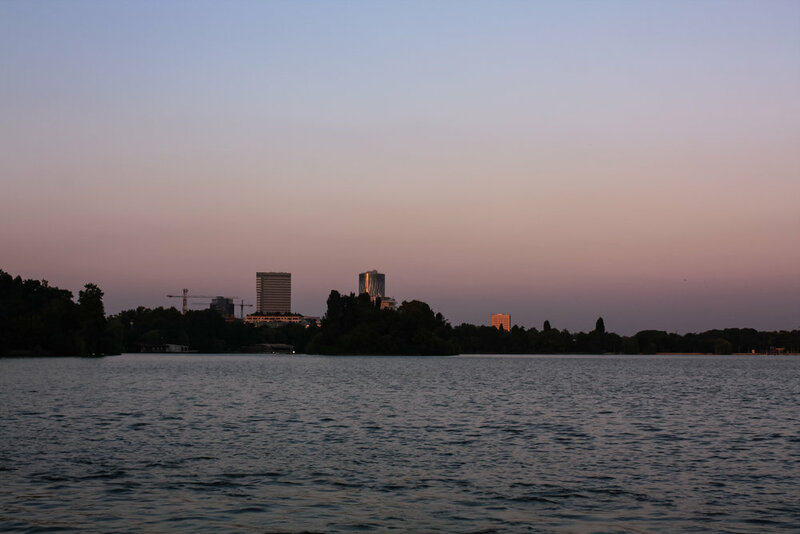 There's also a nice terrace restaurant, Gradina Cismigiu (map), that opens in the evenings in the serves a pretty decent gelato with a great view of all the action on the lake. There is an nice photo spot of the Aleea Magnoliei bridge. Kiselleff Park: Is a small and very green park. Has a small market on Friday mornings. If you don't get to visit, you haven't missed much other than a nice place to sit. Herastrau Park (Parcul Herastrau): (map) This is the largest park in Bucharest and is situated around the massive land-makde Lake Herastrau. This park is definitely worth spending an afternoon walking around. Inside the park is the Dimitri Gusti National Village Museum - map, which is a large open air display of traditional Romanian dwellings and dating back centuries. There are exhibitions and traditional activities that kids can join in. There are a large number of paths through the park and I would suggest hiring one of the I'Velo bikes (need to purchase a card from one of the offices) from the south-west entrance (near to the Arch of Triumph). You can take cruises on the lake or hire small row boats. There are quite a few restaurant and cafes around the park, however if you are looking for a bit of atmosphere to unwind on a summers afternoon, definitely pay a visit to Beraria (map) - it is set up like a European beer garden with themes of many popular European cities. The food is good and they have a huge range of beers! Something that surprised me a lot was how late cafes and restaurants opened in Bucharest. If you like to go our for breakfast, you might spend a lot of time searching. Even in Old Town where there are lots of small restaurants, most dont open until 10am or more often midday - so hotel breakfasts are going to be almost a necessity! Caru Cu Bere (below) does serve breakfast from 8am if you are in the Old Town area. 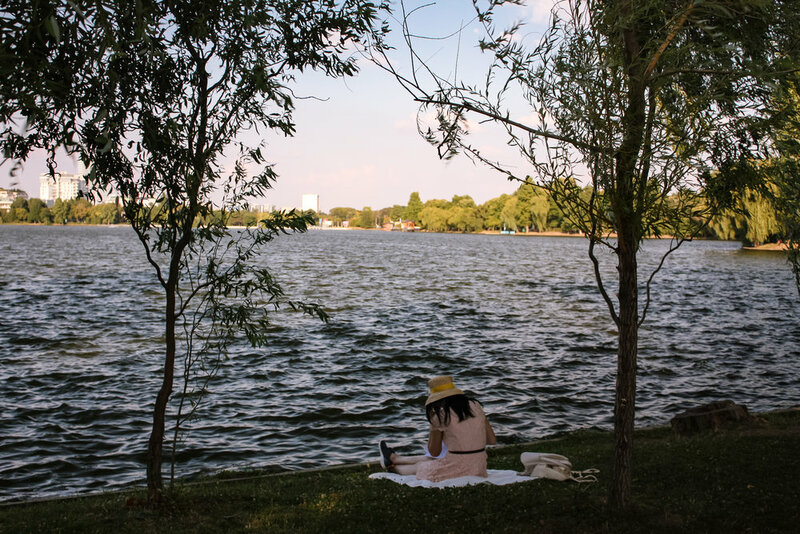 Other places discussed above include Beraria (Herastrau Park), Gradina Cismigiu (Cismigiu Park), Teresa Platou (Obor Market). 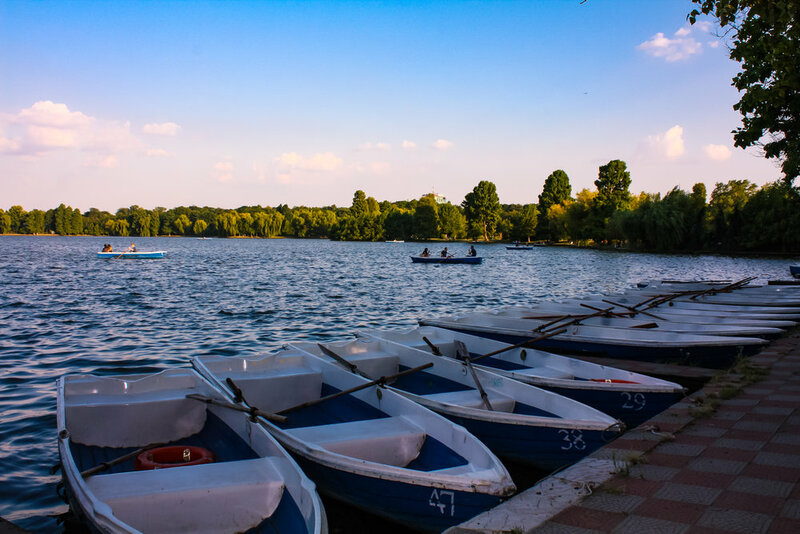 If you get the chance to do a day trip out of Bucharest there are some great places to visit. While I was there many people recommended visiting the town of Brasov - the landscape is meant to be stunning and theres some interesting history. It is a full day or an overnight trip, so you might want to plan this well in advance. Instead, I took the bus out to the Monastery in Snagov where it is said the body of Vlad "The Impaler" Tepes III is buried. Following his death, his head was taken to Constantinople and his body was buried in a small Monastery on and island in Lake Snagov. Unless you have your own car, you will need to either Uber (which will be expensive) or catch public transport. The small buses are cheap (6 Lei) and relatively easy to catch from the station Piata Presei (map) - there is a small "ticket office" for AXI tours. There are 2 buses that run to Snagov - the 261 will take you to Silistea on the North of the lake and the 262 will take you to a road on the South. I took the 262 and it is a shortish walk to the Hotel Astoria (map). It is a little confusing but from the Astoria it is possible to convince someone to take you for a short boat trip to the Monastery island. The boat ride itself is quite fun and gives a good look around the lake. The man charged me 50 Lei, however this rate seemed that it was quite "flexible" The Monastery itself is small and has some interesting history about Vlad III - entry is a small fee (15 Lei). It remains unclear exactly why he was the inspiration for Bramm Stokers fictional character, Count Dracula - other than his bloodthirsty regime, there is no evidence to suggest he actually drank blood etc. Whilst I never felt "unsafe" in Bucharest, I would advise to avoid the taxis, so downloading Uber on your phone and making sure you pick up a data card makes getting around much easier! Pleasantly surprising, full of culture. Bucharest is a city that wasn't high on my travel list.........but I am really glad I booked the flights. I wish I had planned to stay a little longer and spend more time exploring Romania.